Following the cheers and gasps of Elon Musk’s latest BFR update in Australia, SpaceX is preparing to return to the bread and butter of its Falcon 9 manifest, opening with a Static Fire test at Kennedy Space Center’s 39A. The test – completed part way into the six hour test window – is an important milestone ahead of the launch of the SES-11 satellite, currently scheduled to take place on October 7. The test involved the firing up of the B1031.2 Falcon 9 booster – which is set to conduct its second flight after successfully lofting the CRS-10 Dragon to the International Space Station (ISS) earlier this year – a launch that was the maiden SpaceX launch from 39A since its transformation from its Space Shuttle era. The Static Fire test is a key dress rehearsal for the launch team and the rocket. As standard, the Falcon 9 rolls out to the pad without the payload – a requirement installed following the loss of the AMOS-6 satellite during a Static Fire accident a year ago – and will fire up its engines to validate – among numerous other data points – the health of engine ignition and shut down commands. Normally, the Static Fire involves the Merlin 1D engines firing for 3.5 seconds. However, “flight proven” boosters, such as the booster that eventually launched the SES-10 satellite – can fire for longer during the test, with options including five and seven seconds of full thrust duration. The SES-11 test appeared to be a five second firing. The window for the test was six hours in duration, opening at 15:00 local time. The long window allows engineers time to conduct any required troubleshooting and recycles during the attempt. The firing occurred around 90 minutes into the window. The vehicle will now be detanked and rolled back to the 39A Horizontal Integration Facility (HIF) for the final leg of pre-launch processing. 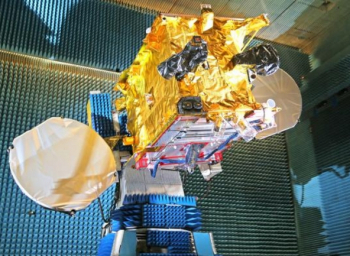 This will include the mating with the encapsulated SES-11 satellite. During the period that follows the ignition of the engines, a quick look review – which is usually followed by a test success confirmation by SpaceX, as was the case again on Monday – and later a Launch Readiness Review (LRR), will take place – the latter finally confirming the launch date. Currently tracking an October 7 launch, the window for the launch opens at 18:53 local and lasts until 20:53. The SES-11 satellite, also called EchoStar 105, is a spacecraft with 24 Ku-band and 24 C-band transponders that will be used to support the continued development of the U.S. orbital arc media distribution neighborhood and provide coverage over North America, including Hawaii, Mexico and the Caribbean. EchoStar 105/SES-11 replaces Ku-band capacity for AMC-15 and C-band capacity for AMC-18 at SES’ well-established 105 degrees West orbital slot. This is clearly needed, given a recent incident that appeared to be related to reported issues with AMC-18 over recent days. A broadcaster, who also happens to be a NSF member, noted that they were informed that “feeds were being moved from SES-1 to SES-2 in order to free up space due to an anomaly with AMC-18”. A number of US satellites have noted issues over recent months. The SES-11 launch campaign is part of a SpaceX doubleheader, with another Falcon 9 deep into preparations from the West Coast. Falcon 9 B1041.1, is set to undergo a Static Fire test on the SLC-4E pad at Vandenberg on October 5, in preparation for an October 9 launch with the next set of Iridium NEXT satellites, the third such launch under their contract with SpaceX. This launch will follow on from the Iridium NEXT-2 launch that took place in June, with the third launch set to transport another 10 satellites into a constellation that will eventually number 75 spacecraft. A third launch in October will take place from 39A, with a Falcon 9 (B1042) now through its McGregor test firing and readying for an October 30 launch. This mission – involving the launch of the Koreasat-5A satellite – is now “Range Approved” by the Eastern Range, with a launch window opening at 15:34 Eastern, running through to 17:58. The Static Fire has been placed on the schedule for October 26. 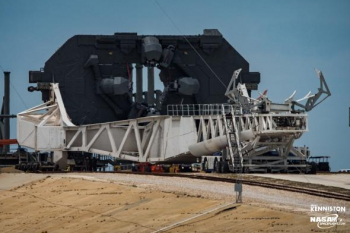 With this launch now confirmed as taking place on 39A, the timeline required to stand down this pad to allow for the Transporter/Erector/Launcher (TEL) to be modified for hosting the first Falcon Heavy mission places this maiden launch in December at the earliest. 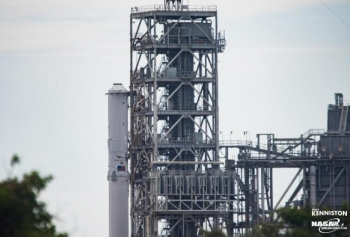 The standdown for 39A is subject to the readiness of SLC-40, which is set to return to action following repairs after the loss of the AMOS-6 satellite last year. Engineers are still busily working on the new TEL that will host Falcon 9 launches from the Cape pad. During Elon Musk’s IAC overview last week, it was again noted that SpaceX hopes to launch the new rocket by the end of the year. However, this is looking increasingly unlikely, not least based on new FCC documentation that appears to point to an additional switch of a Falcon 9 mission from the SLC-40 to 39A later this year. SpaceX is yet to update the status of SLC-40’s return, which will provide an update to the Falcon Heavy schedule.